Holy crap! It's been around 6 weeks since my last post on here, things have been crazy and very very busy so apologies for that. Both the BBC and co-creator Steven Moffat have confirmed that a third series of the Sir Arthur Conan Doyle's "Sherlock Holmes will air. Co-creator Steven Moffat tweeted "Yes of course there’s going to be a third series — it was commissioned at the same time as the second. Gotcha!" 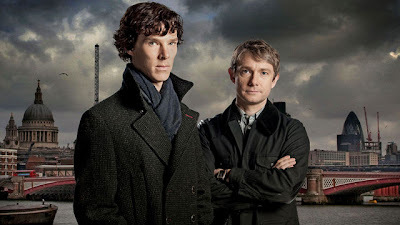 The show airs on PBS in the United States, stars Benedict Cumberbatch as Sherlock Holmes with Martin Freeman as Dr. Watson. The question at hand is if the stars stars Cumberbatch and Freeman would be able to return. Both actors schedules are growing and getting increasingly packed but sources indicate that both would return for the third series. The third series is in the early planning stages of 2013 with the series two beginning to air in the United States in May. Me and the missus are avid fans of Sherlock and the end of the second series was fantastic. Can't wait for more!